Over his lifetime, as the second generation on a three generation tenancy on the National Trust’s Wallington Estate, Alistair Watson has seen trends in livestock production come and go; he’s seen advice in farm management turned on its head and he’s seen outlets for his stock change or close. Throughout this time, he has adapted to every eventuality, changing his farming to suit demand, but always targeting the premium market. Farming at Dykehead Farm, in partnership with his wife, Mary, and son, Anthony, the family has had its share of success. A 125- head suckler herd is at the heart of the business on their upland grassland farm and all of the farm’s major improvements – from drainage and building to fencing and reseeding – have been funded by income from the herd. Admitting he has ‘taken the farm by the scruff of its neck’, Mr Watson is less forthcoming in describing the prizes he has garnered along the way. Regularly taking trophies and championships for his stock in markets across the North East – Hexham, Scots Gap and Rothbury – he was even rewarded in the 1990s as the National Beef Farmer of the Year. “We used to run 150 suckler cows and sold all the progeny off their mothers at the suckler sales,” he says. However, when the National Trust opened a farm shop on the estate, the Watsons switched to finishing beef to keep the shop supplied, and slightly down-sized the herd. “But we found the continental cross cattle did not finish well on grass and never had the fat required by the shop,” he says. With a few difficult calvings into the bargain, the decision was taken to switch from continental to Aberdeen-Angus sires. However, when the shop closed in 2012, the family – by then accustomed to finishing their cattle – stuck with the finishing system but moved their sales to Burradon-based Linden Foods. Always keen to achieve the best possible meat quality, carcase grades and prices, the stock are reared on a largely forage-based diet. Mostly born from mid-April till June, they spend their first summer at grass with their mothers and move on to concentrates and silage once they are housed and weaned. At this time, they were introduced to ForFarmers Prime Beef Grower nut which contains the live yeast product, Levucell. This is considered to play and important role in the cattle’s performance and they remain on the nut through both winter periods of housing throughout their lives. “The most important thing for finishing animals is to make sure they are not stressed and the cattle on this system appear very content,” says Mr Watson. The 1kg/head they are given after weaning is gradually increased to 2.5kg/head, which is fed once a day. “It’s important we can give all the concentrate in one feed, as if we had to split feeds, it would be a lot of extra work,” he says. “And we have stuck with this system over many years as the animals seem to thrive on it. Deadweights are 340-350kg for heifers and 365-375kg for steers and stock are sold from November to May. “This ensures they get a reasonable amount of concentrate, right up until they are finished,” he says. Grades are mainly Rs (85 per cent) with the remaining 15 per cent U grades. “We don’t really get any Os because of the continental dams,” he says. However, because they are Angus-sired, they earn and extra 30-35p/kg premium. Feeding forage is at the heart of every successful, extensive beef production system and exploits the ruminant’s unique ability to turn material into the highest quality protein. Any process which can improve the digestibility and the release of nutrients from that forage will increase the utilisation of this important, home-grown feed. And if that process also improves rumen development and function, it helps lay strong foundations for healthy stock, good liveweight gain and profitability. Nick Berni, ruminant product manager with ForFarmers, says: “This is why ForFarmers includes Levucell in several of its beef compound feeds, including those like Prime Beef Grower which have been formulated particularly to complement forage-based diets, whether grazed or conserved. “As a rumen-specific live yeast, Levucell helps create the right environment for optimum fibre digestion, breaking down hemicellulose and cellulose, exposing more of the fibre’s surface area for improved digestion by the rumen microflora and releasing more of the forage’s nutrients,” he says. It achieves this through numerous processes, including scavenging oxygen, which helps to maintain the anaerobic conditions of the rumen and creates just the right environment for the desirable microflora to do their work. “It also mops up lactic acid, so raising and regulating the rumen’s pH at close to the desirable pH6.2,” says Mr Berni. 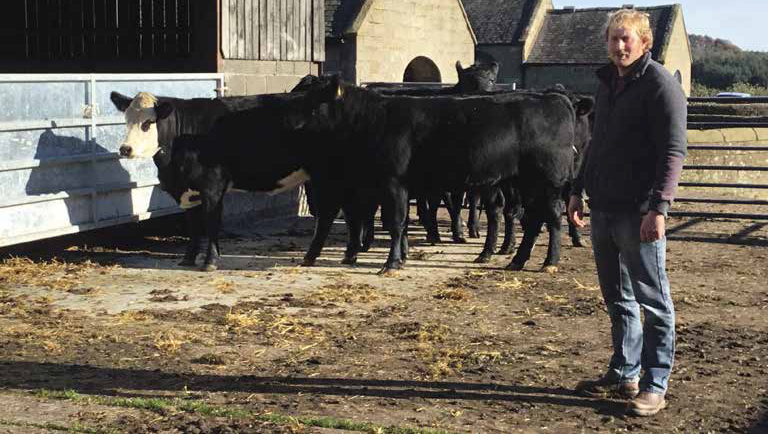 “The overall effect is improved rumen health and better animal performance, allowing the farmer to make the very best use of the forage on the farm. “This, in turn, helps our customers have more profitable ruminant enterprises which creates a win-win situation for us all,” he says.